First things first - this swap is open to women only! Please bring your items at 4PM sharp. You must bring at least 3 pieces of good quality, clothing/shoes/bags/accessories, there is no maximum limit. They will go through quality check between 4-5 pm, during which time you can enjoy some snacks and non-alcoholic beverages on the house and meet other women. The swap will begin at 5 pm. We will stop accepting clothes at 4.30 pm. You are free to bring a swap buddy (sister/BFF/mom). If not, we’ll be happy to pair you up with someone or you can go at it solo. Our team will be present throughout the event to facilitate a smooth swapping experience for you. If you think you’ll need a handbag, please bring your own. 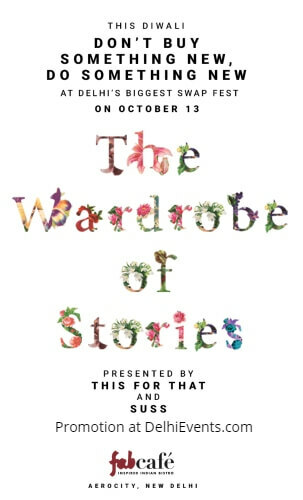 This for That, India’s first fashion swapping platform and SUSS, a community and movement that drives conversations around sustainable fashion, are bringing Delhi’s biggest swap fest, The Wardrobe of Stories. This festive season, we are encouraging women to not buy something new but do something new by exchange beautiful sarees, ethnic wear, jhumkas, bags, shoes, shirts and just about everything that they would otherwise step out to shop for. All this with like-minded women, who will open up their treasured wardrobes to exchange not just beautiful pieces but memories, traditions, and stories. With great food, music and company (all on the house), we promise it’ll be an evening to remember! celebrations coupled with massive discounts and tempting deals means that retail sales skyrocket during this time, often by as much as 20 percent. Festive season accounts for as much as 40% of annual sales for most retailers! Clothes are a massive proportion of these sales, with most of us trying to create new looks for each festival, wedding, and card party. But what does this mean for our wardrobes? Often it means a hoard of new clothes that we probably don’t wear more than once. In fact, our relationship with clothes has changed drastically in the past few years. The average person buys 60% more items of clothing and keeps them for about half as long as fifteen years ago. Moreover, 40% of clothes bought are rarely or never worn. The fashion industry is booming, but it has environmental consequences as the rate at which we throw away clothes is increasing. The festive season sales and advertising further exacerbate this problem as people feel compelled to buy more and more. And that’s why this festive season, we’re bringing to you a fun alternative to shopping, which is not only as exhilarating but is also free and good for the environment! Swapping essentially means exchanging an item of clothing, a pair of shoes, bag, or accessories, with a friend, acquaintance, or stranger. It is an excellent way of renewing your wardrobe by exchanging items you don’t use anymore for something you’ll love and actually wear. Through our swap fest, we’re bringing women together to swap, not shop, with great music, drinks, and food (all on the house)! In the process, we want our attendees to have a novel experience, make new friends, and learn the stories behind each piece of item they take back. We’re also planning an upcycling pop-up where people can repurpose some of their clothes if they want.